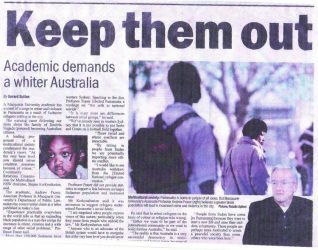 In 2005, Andrew Fraser, an Associate Professor of law at Macquarie University, wrote a short letter to his local paper, the Parramatta Sun, protesting against the immigration of Somalians into Australia, stating that African migrants were known to be associated with high levels of violence. Professor Fraser's letter was in response to an article in the 29 June 2005 edition of the Parramatta Sun, about Somalian refugees . 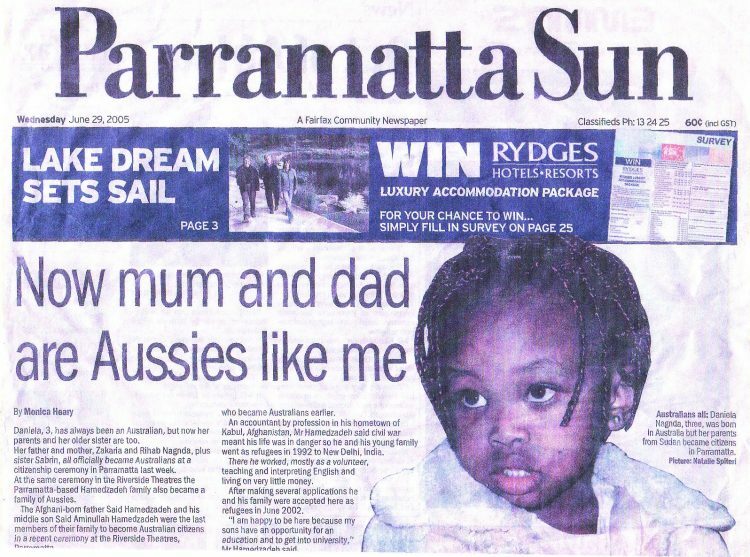 On the cover was a picture of a young Sudanese happily announcing that her parents had just become Australian citizens: "Now mum and dad are Aussies just like me". It was the usual propaganda story of the style typically run by Multiculturalist newspapers in favour of immigration. The newspaper not only published Fraser's letter in their 6 July 2005 issue, but also used it to create their lead news story - attracting the attention of the general public with a banner headline on its front page saying "Keep Them Out". Now that a large number of Sudanese refugees have been settled in the Parramatta-Blacktown area, Anglo-Australians are once again expected to acquiesce in the steady erosion of their distinctive national identity. Australia, it seems, can no longer remain the homeland of a particular people. Instead, it must become a colony of the Third World. Thirty years ago, no one in the world had any difficulty identifying an Australian. Today, if the headline in the Sun is to be believed, black Africans and Muslim Afghanis "are Aussies just like" the descendants of the Anglo-Celtic pioneers who settled and built this country. Community Relations Commissioner Stepan Kerkyasharian declares that "Australians ...have a responsibility" to help those on the losing side in Third World civil wars to settle here, wherever and whenever it suits governments and the ever-expanding refugee industry. He assures us that the ethnic and religious conflicts endemic to every other part of the world will be magically dissolved by the state-enforced "commonality of Australianism." That utopian fantasy is particularly likely to unravel as local African tribal groups grow in size and confidence. Experience practically everywhere in the world tells us that an expanding black population is a sure-fire recipe for increases in crime, violence and a wide range of other social problems. The fact is that ordinary Australians are being pushed down the path to national suicide by their own political, religious and economic élites. Shutting our eyes to that fact will not make it go away. More specifically, in an interview with the Sydney Morning Herald, published on 16 July 2005, I observed that migrants from sub-Saharan Africa were not the only sources of ethnic friction in contemporary Australia. I stood by the comments I had made in a private e-mail to David Shoebridge that East Asian immigration posed other, no less intractable problems, suggesting that one need only "Look at the annual HSC results - the consequence of which is that Oz is creating a new heavily Asian managerial-professional ruling class that will feel no hesitation... in promoting the narrow interests of their co-ethnics at the expense of white Australians." Prof. Fraser was interviewed by Ray Martin on the television program "A Current Affair" (Channel 9) on 18 July 2005. On the show, Fraser explained that "Sub-Saharan Africans have an average IQ of 70 to 75" and that underdevelopment in Africa reflected a "difference in cognitive ability of blacks and whites". Ray Martin was apparently not able to refute Fraser's scientific evidence, and instead responded by schoolyard-style slander, saying "That is Adolf Hitler stuff! It's just rubbish". The television station arranged a telephone poll on the issue, asking whether or not people agreed with Prof. Fraser's view that Asian and African immigration were bad for Australia ("Do you agree with Professor Fraser that non-white immigration is a threat to Australia?"). Over 36,000 people responded to the poll, with the result being that 85% said that they agreed with Prof. Fraser's comments. Typically, rather than debate the issues at hand, the Multiculturalists immediately began to attack Prof. Fraser, demanding that he be sacked from his teaching position at Macquarie University. As usual, the anti-democratic and neo-fascist nature of Multiculturalists came to the fore as they once again demonstrated their belief that anyone who disagreed with their world-view should not be allowed to speak in public. Unfortunately for Australian democracy, Multiculturalists give lip-service to the concept of freedom of speech, but then try to deny it to anyone who opposes their ideology. Multiculturalism is a political ideology that keeps its grip upon Australia by threats, intimidation, and bullying. Many people who have expressed opposition to Multiculturalism or who have promoted the value of White Australia immigration policies have found their livelihoods jeopardised, and even their physical safety (and that of their families) threatened. Initially, when the Multiculturalists began their intimidation campaign against Macquarie University, demanding that they sack him, the institution stood by Professor Fraser's democratic right to freedom of speech. Acting Vice Chancellor John Loxton (the actual Vice Chancellor was on an overseas jaunt) issued a statement on 15 July distancing the university from "racism," but even-handedly noted that there are "bodies of research to support all sides of the argument". Yesterday on my return from overseas I and other colleagues met with a number of leading representatives of the Sudanese community and the African Community Council in Sydney. I assured them that I personally disagreed profoundly with the views Professor Fraser has been propounding, and that the University as a whole dissociates itself from those views. I apologised to them both for the fact that Professor Fraser had signed his initial letter as an associate professor of Macquarie University, which doubtless gave it more weight, and for the distress and hurt caused thereby. They graciously accepted my apology. ...he told me that the university wanted to buy out my contract because they were suffering reputational damage and loss of students as a consequence of the controversy. The next day, when I spoke to him face to face, he told me essentially that the university was a business, it had a business plan; that business plan was oriented to attracting foreign students, and the controversy over my public comments was impacting adversely on their attempt to get into that market. It is not known what special knowledge Professor Yerbury herself possesses on issues relating to racial differences and immigration that would entitle her to condemn Professor Fraser's public comments out of hand. What is clear, however, is that the Vice-Chancellor's personal disapproval of Professor Fraser's views explains the refusal of the University to offer him the same Honorary Associate status customarily extended to other retired academic staff still actively engaged in scholarship and research. In effect, Professor Fraser said, the University is offering him the academic equivalent of a dishonourable discharge. To accept its terms would amount to an admission that he had somehow brought the University into disrepute. There is absolutely no basis for any such imputation of academic misconduct. In his public comments, Professor Fraser has merely stated the truth to the best of his professional knowledge. In response, a coalition of ethnic and leftist groups has conducted a concerted campaign designed to force Professor Fraser out of the University. Professor Fraser believes that the Vice-Chancellor was wrong to make any apology on behalf of the University; in doing so she has sacrificed the time-honoured traditions of academic freedom to the illegitimate demands of ethnic pressure groups and political extremists determined to impose an ideological dictatorship upon Australian universities. Professor Fraser also rejects any suggestion he, too, should apologise for his recent public comments. His argument that the White Australia Policy was fundamentally sound and that it was a mistake to abandon it falls squarely within his area of expertise and is an academically defensible view shared by a great many other Australians. Professor Fraser regards the Vice-Chancellor's apology as an appalling display of intellectual cowardice on the part of the leadership of one of the most important institutional bastions of European civilisation in Australia. Universities once prided themselves on their commitment to the search for truth; to suppress data well-known to psychologists, criminologists, historians and legal academics merely because the truth might cause "hurt and distress" to certain protected minorities calls into question the whole point and purpose of the University. Professor Fraser has decided to remain in place at Macquarie in an effort to expand the boundaries of acceptable academic, public and media debate on issues relating to race and Third World immigration as well as the nature and role of the public university. The debate over his stated views is threatening to spill over into the classroom. It seems from what he has told the Australian that there is grounds for concern that some students may seek to enter the classroom and prevent the classes proceeding and hence interrupt the transfer of knowledge. Moreover, his comments have elicited such a strong response from students, staff and the public that it is affecting the university's ability to operative effectively. In response to these difficulties, Tim Sprague after discussion with senior management and the Dean, has informed Drew Fraser that it will not be appropriate for him to teach until further notice. I think that they should allow his classes to continue. ... Those who so strongly argue for free speech and academic freedom and rigour, I think they should strongly disagree with what he's said if that's their view - and it's certainly mine - but nonetheless respect the fact that he as an academic has a right to express it. Prof. Fraser came to class on 31 July only to find that he and 20 students were barred from their usual lecture hall. "It was a completely unprecedented experience," he said, "I have never, ever, heard of students and teachers being locked out of a classroom". Instead, Prof. Fraser spoke to students in his office. In September 2005, hot on the heels of the denial of his democratic right to free speech at Macquarie University, Fraser was again the target of yet another denial of freedom of speech. Professor Fraser had authored an academic article regarding the White Australia Policy, which had been peer-reviewed and accepted for publication by the Deakin University Law Review. George Newhouse, a lawyer involved in the original complaint against Fraser over his letter to the Parramatta Sun, threatened to sue Deakin University on the grounds that the article was unlawful on grounds of racial vilification. Apparently, Newhouse had not even read the article. The Vice-Chancellor of Deakin University, Sally Walker, citing legal advice, directed the Law Review not to publish Fraser's article. Vice-Chancellor of Deakin University Sally Walker has destroyed, in a single mad moment of political correctness, the basis on which taxpayer-funded support for university research stands. This cautionary tale begins with Drew Fraser's invited article. He utilised the well-known paradigm of "racial realism" that now informs the work of many scientists and social scientists in the United States and Europe. Racial realism, based on new genetic and paleo-anthropological research, rejects the egalitarian dogma that race is only skin deep. It contends that racial differences are real, not social constructs, and that an understanding of how races differ in cognitive and athletic ability, temperament and behaviour is obviously relevant to a wide range of policy - for example health, education and criminal justice - issues. Two reviewers recommended publication, and suggested amendments. The author then submitted changes and additions and the article was accepted. As the issue was heading to the printer, lawyer George Newhouse, on behalf of the Sudanese community, threatened to sue Deakin University on the basis that the [sight unseen] article was unlawful on grounds of racial vilification. The casualties will be not merely academic excellence, and the economic progress and social peace that could follow but, more importantly, hope itself, the only antidote to despair. Those who now presume to manage the limits of free thought may have to reap the bitter fruits of the poisoned seeds they have sown. Once a people falls into despair, they may become dangerously unpredictable. Apparently, in contemporary Australia, people of white, European ancestry can be identified routinely as the root of all evil while it is forbidden for whites ever to mention publicly the social pathologies associated with black Africans, even if they are well-known to any informed person and openly acknowledged by reasonable black people themselves. For all practical purposes, the decision of the Commission has rendered nugatory, the assurances of the politicians who assured Australians that the passage of the racial vilification laws would not threaten our historic liberties. Even before the Commission's decision, Deakin University had refused to publish a peer-reviewed article by Professor Fraser on the subject of race and immigration while Macquarie University has forbidden him to teach in any subject area. The Commission's proposed resolution of this matter echoes the methodology employed during the show trials in Stalinist Russia where defendants were compelled to confess their thought crimes and beg public forgiveness. No fair-minded person can miss the Orwellian overtones of this matter. Doublespeak and double standards appear to be built into the very nature of a "human rights commission" committed to the suppression of free political expression by powerless individuals. As Professor Fraser has noted, media commentators who have made statements that vilify White people, or those who have expressed a belief in African superiority in sports, have received no persecution from Multiculturalists and the media. Not only are the so-called "racial vilification" laws morally wrong in their very conception, but they are being specifically and deliberately used as an instrument of bias against White people. Multiculturalism and its strategies are continually shown to be lacking morality. Was the violence in America's deep south caused by black people? I always thought it was caused by whites. Was there murder and mayhem on a great scale in Australia, caused by indigenous blacks, before white people came? I always thought it was the white settlers who did that sort of thing. Similar to the tactics used by so many other journalists who are Multiculturalists, Boag goes on in his article to misrepresent and belittle the views of Professor Fraser, in yet another typical case of Multiculturalists attacking their opponents without even trying to debate the issues and scientific evidence presented. No matter how much truth and facts are presented, Multiculturalists always seem to dodge around the evidence, using banal clichés and platitudes instead of solid arguments; no doubt, because the ideology of Multiculturalism is built on shaky ground indeed. Canadian-born Andrew Fraser has adopted the Australian people as his own, and we are lucky to have a man of his calibre, one who is willing to stand up, proclaim the truth, and fight for his people - despite the authoritarian and sleazy tactics of the Multiculturalist traitor class and their minions. His fortitude has inspired many ordinary Australians to stand up for their nation. At the time of writing, the saga of the Multiculturalist persecution of Professor Fraser seems to have ceased, although it has not necessarily been resolved. It should be remembered that, whilst certain ethnic groups and lobbyists have made use of the "racial vilification" laws, that such laws - put into place by Liberal-Labor politicians - were specifically designed to stifle free speech on immigration issues, oppress the political opponents of Multiculturalism and Asianisation, and to therefore undermine the democratic fabric of Australian society. The Australian people are being eliminated, sacrificed on the altar of Multiculturalism - a political ideology that pushes a theory of "strength through ethnic diversity", underpinned by the creation of an authoritarian "politically correct" society. An extremist ideology, Multiculturalism is dividing and destroying Australia, as well as other Western nations across the world. It is the policy of the Australian government and the Multiculturalist "power elite", both implicitly and explicitly, to decrease the safety and security of the Australian people by increasing the proportions of racial minorities, leading to national suicide and the destruction of our unique cultural identity and way of life. In the end, it is our children, grandchildren, and descendants who will suffer the most, as they grow up to face the realities of this senseless and needless genocidal policy - unless patriotic Australians rise up to reclaim their nation's future. Letter from Andrew Fraser to Ms Sadie Hamer, 10 October 2005, op cit. See also: Andrew Guild, "Professor Andrew Fraser vindicated, again", (Ironbark Resources), http://www.ironbarkresources.com/articles/guild200701fraservindicated.htm, January 2007. Jared Taylor, "Australian Professor Sticks to His Guns: Wins Support" [2 August 2005], op cit. Charles Boag, "Drawing the line in a multicultural society has no basis", Parramatta Sun, 6 July 2006.